UNITED NATIONS, United States — The UN General Assembly on Wednesday formally ratified a UN deal on migration by a large majority -- but without the support of the United States and a string of other countries. Twelve countries abstained while five nations voted against it -- the United States, Hungary, the Czech Republic, Poland and Israel. Billed as the first international document on managing migration, it lays out 23 objectives to open up legal migration and discourage illegal border crossings, as the number of people on the move globally has surged to more than almost 260 million, or 3.4 percent of the world' population. Rows over the accord have erupted in several European Union nations, sparking the collapse of Belgium's coalition government and pushing Slovakia's foreign minister to tender his resignation. In Europe -- where a wave of migration from the Middle East and North Africa in 2015 bolstered far-right politicians -- a dozen states either opposed the pact or abstained. Hungary once again denounced the pact as a "serious mistake" and raised the specter of a fresh influx of migrants, while Brazil's far-right president-elect Jair Bolsonaro said migrants had made parts of France "unlivable" and announced he would withdraw from the pact. But UN Secretary-General Antonio Guterres warned at the summit last week in Morocco for world leaders to sign off on the text that "we must not succumb to fear and false narratives." German Chancellor Angela Merkel also sought to quell fears at the meeting, saying the aim of the agreement was to prevent, rather than encourage, illegal migration. "This is about safe, orderly and regular migration -- it says (this) clearly in the title," she said. Despite the nationalist furor that forced Belgium's prime minister to tender his resignation Tuesday, Brussels voted for the pact at the General Assembly. 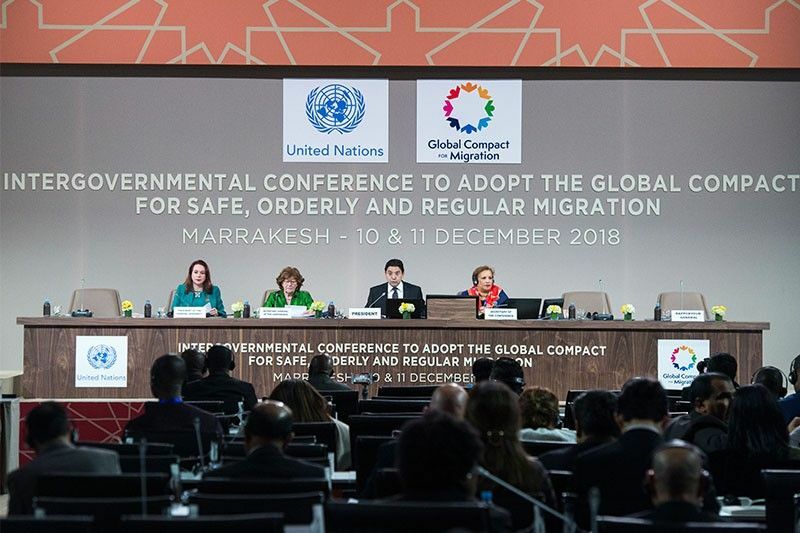 The pact includes a series of principles -- including the defense of human rights, recognition of the sovereignty of nations -- as well as a list of collaborative tools, such as sharing information and expertise and integrating migrants. It stipulates that the detention of migrants should only be a last resort in tackling the global problem. Amnesty International, a human rights group that supported the pact, said the countries that refused to endorse it -- including the United States, Australia, Hungary, Italy, Poland and Austria -- had been responsible for the "worst abuses against migrants in recent years."